I am a certified personal trainer following my dream of helping other moms on the fit lifestyle. However, I want women to know that life is about more than JUST workouts and clean eating. I'm going to share a little secret with you also. I don't ALWAYS eat completely clean. We eat cookies. Pizza is my favorite food group. Life is about being healthy and happy. 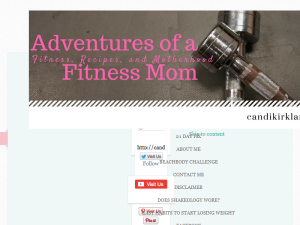 This what your Adventures of a Fitness Mom Blog Ad will look like to visitors! Of course you will want to use keywords and ad targeting to get the most out of your ad campaign! So purchase an ad space today before there all gone! If you are the owner of Adventures of a Fitness Mom, or someone who enjoys this blog why not upgrade it to a Featured Listing or Permanent Listing?